The Web.Comp 2018 Design Tournament has recently wrapped up and, once again, we were really impressed by the quality and creativity of student designs. 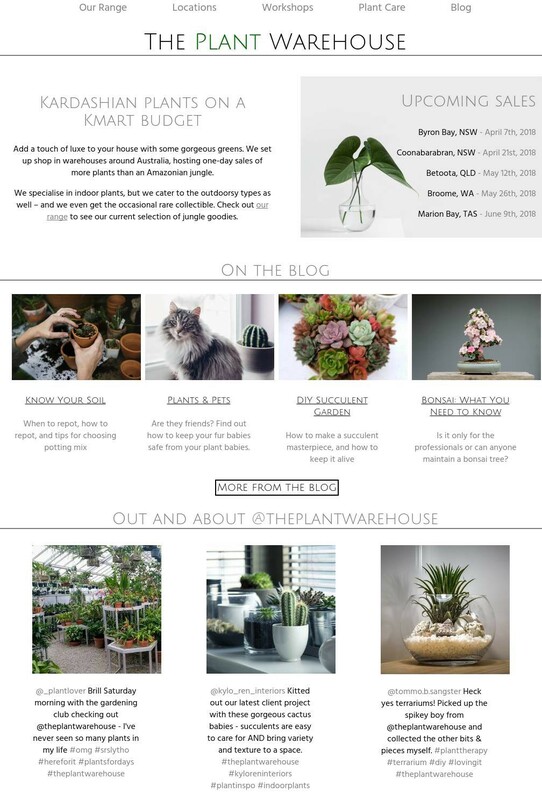 In the Beginners stream, students designed a web page for a plant store, The Plant Warehouse. You can see the winning designs, chosen by popular vote, on the Beginners Leaderboard. 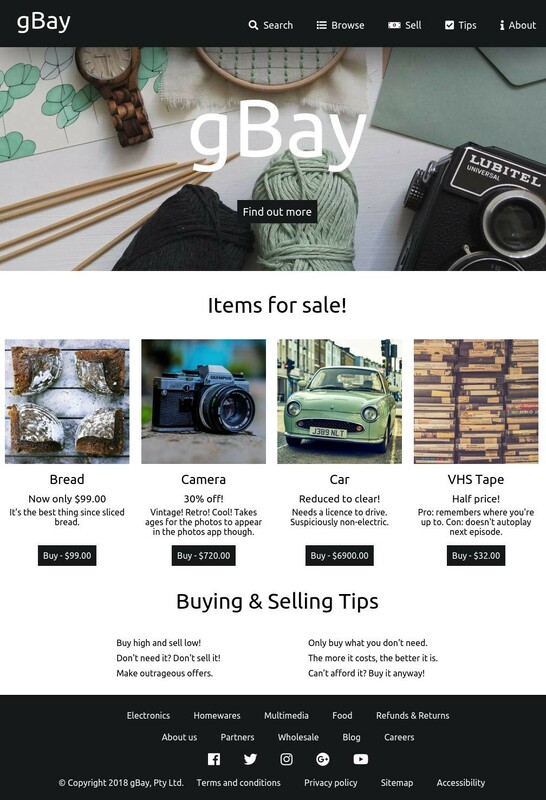 In the Intermediate stream students created designs for an online marketplace, gBay. Check out the Intermediate Leaderboard to see the top-voted submissions. A huge congratulations to those students who made it onto the Leaderboards! Unfortunately places were limited, and there were plenty of fantastic submissions which didn’t make it. We wanted to highlight a few of the designs which really impressed the Grok team, so here’s our round-up of Grok’s picks! We loved this professional-looking submission created by a Lovena Young! She’s done a fantastic job using white-space, background images, and subtle borders to logically organise the information on the page, giving it clear readability with aesthetic appeal. Her clever use of various rounded corners is both visually interesting and also helps to create landmarks on the page which draw the eye and assist the reader in understanding the organisation of the content. One of the most common questions we received from students during the Design Tournament was “how do I make the elements on the page side-by-side?”. Page layout can be tricky, but Jasmine Hinds nailed it! Additionally, her sparing use of a capitalised font for the headings attracts the eye and provides a clear organisational cue for the the reader, while the thin lines and subtle font-colour keep the headings from looking too heavy or overbearing. Another great design from a student in New South Wales! We really like the use of a large hero image to capture the reader’s attention. Like the other designs we’ve highlighted above, this student used a cool colour scheme with lots of lush greens and soft grays and blues which are evocative of the natural world and complement the theme of the page. Again, this design uses negative space and selective use of narrow borders to separate elements on the page in a way that feels airy and spacious, which is both aesthetically appealing and complements the theme of the page. This student from Victoria used their own images to create a unique feel for their design which really stood out among the other submissions. This student’s choice of images and use of a cool, muted colour scheme with lots of greens and browns creates a vintage, hand-crafted feel. At the same time, the contrasting black and white branding stands out to also make the page feel modern and professional. We thought Sylvan Tam also made some great colour choices! The warm pinks are energetic and inviting, and we liked the way she used different shades of the same colour and the geometric background to break up the content on the page, and for highlights to draw the eye to important information. For example, the ‘buy’ buttons are probably the most important element on the page for an online store, and this design does a great job of making them stand out with a bright colour and clear, contrasting text, and of making them look clickable with rounded corners and plenty of padding. Lastly, we really liked this fun design from Kshipra Vaidya. She’s used complementary colours (colours opposite each other on the colour wheel) to create a design that pops, and feels fresh and playful. The cursive font used for the headings, the unexpected shapes of the buttons and other rounded elements on the page — particularly the cloud shaped aside! — contribute to the youthful feel. Well done to these students for their incredibly hard work, and their considered and creative design choices! We love seeing what students create in the Design Tournament each year and are already counting down until next year’s Web.Comp! If you or your students are interested in getting involved in Web.Comp, or one of our other coding competitions, make sure to keep an eye on our events calendar for dates! Thanks to Ben Taylor and Jess Norris.